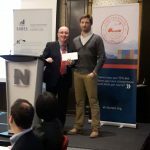 As part of its marine industry promotional campaign, SODES awards a $1,500 scholarship to a graduate or postgraduate student in a field related to the maritime industry, as well as to a Institut maritime du Québec student. Promote university graduate-level studies in fields related to responsible marine-sector economic development. Examples: transport logistics, oceanography, environment, engineering, international trade, international logistics, water sciences, geography, administration, etc. *Grant available for the years 2017 and 2018. Show leadership and involvement in his/her field. To receive this grant, you must participate to the SODES luncheon-conference on November 22, 2018 in Montreal. In 2018, Sodes awarded the Sodes next generation scholarship to Éric Walling, a PhD candidate in chemical engineering at Université Laval, Quebec. Brigitte Robineau, Executive Director, Inter-institutional oceanographic research group of Québec, Québec-Océan. They recognized the excellence of Mr. Walling’s candidacy and the relevance, for the marine industry, of his research project “Développement d’un outil d’aide à la décision pour la valorisation des matières organiques résiduelles” (Development of a decision-making support tool for using organic waste). 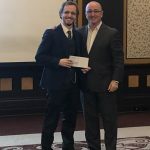 Sodes awarded the SODES Next Generation scholarship to David Didier, a PhD candidate in Environmental Sciences at the Université du Québec à Rimouski and Montréal. The jury, consisted of Céline Audet, Institut des sciences de la mer (ISMER), and Theme Director, Resources, marine energies and health of the maritime economy, Réseau Québec Maritime (RQM); Yan Cimon, Full Professor and Director, Interuniversity Research Centre on Enterprise Networks, Logistics and Transportation (CIRRELT); and Candice Sénéchal, MerLIN Project Coordinator, Technopole maritime du Québec. The jury members recognized Mr. Didier’s academic excellence and the relevance of his research project analyzing and developing a mapping model of coastal flooding in the Estuary and the Gulf of St. Lawrence in a context of climate change, entitled “Analyse et développement d’un modèle de cartographie de la submersion côtière dans l’estuaire et le golfe du Saint-Laurent dans un contexte de changements climatiques”. SODES also recognizes the academic excellence of Institut maritime du Québec (IMQ) students.